Logs pressed keys in any application, translating them to special characters like ä, ö, ü, ß. Tracks and logs any messages sent and received on Facebook social network. Captures screenshots every few minutes and lets you see what was happening on the screen. 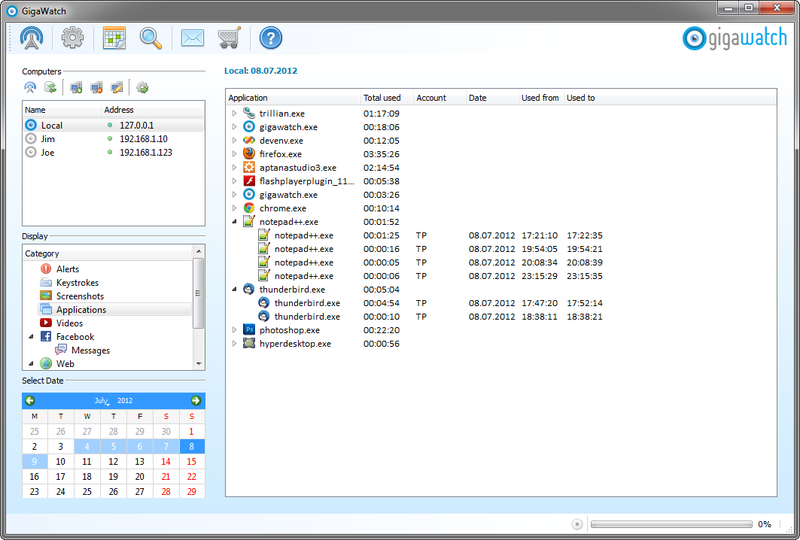 Logs all chat conversations which take place in Skype application. We are first to implement this feature! Stay up to date whenever user performs an action that interests you the most. That's not all. See the complete list of features our application has to offer. Display activity times of all applications that user launched on the computer. All new additional features will be distributed to users free of charge! 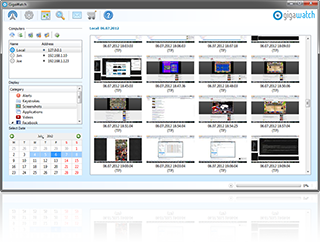 GigaWatch offers the most reliable solution to Computer Monitoring. Thanks to its clear-cut approach you'll hit the ground running. Works on Windows XP, Windows Vista, Windows 7. Supports both 32-bit and 64-bit versions of each operating system. No Mac support, sorry! Kids these days spend most of their time in front of the computer browsing the internet. What if they look for content not suitable for them or talk to strangers who can harm them? It's imperative these days that all modern parents are equipped with tools that will allow them to shield their children from the threats of the online world. Monitoring their computer activity can prevent disasters and can lead to better parenting. Research shows that employees at work do many things on the computer apart from working. Do you want to see how long they browse the web or play solitaire while you pay them for every minute at the office? Using GigaWatch to monitor your employees can increase their efficiency and drastically cut your costs of running the business. It's hard to motivate yourself to work on the computer when there are so many distractions around. Do you need that extra push to motivate yourself enough to get the job done? GigaWatch can help you monitor your own work efficiency and let you decide whether you're putting enough effort to it. 1. What makes you different from keyloggers and other computer monitoring software? Instead of filling you with the usual "our software is the best" talk, we prefer to be honest with you. There are plenty of well developed keyloggers and computer monitoring software that have been on the market for more than 10 years. Although our application is relatively young and we may not have as many features as our competitors yet, we focus greatly on high quality of our product, building strong relationships with our users and ease of use. Computer monitoring software must be stable or else it will make using the computer a nightmare. Our goal is to create the most reliable and light-weight software which won't interfere in any way with what you do on your computer. Over years we plan to implement new monitoring features into GigaWatch and you'll be able to receive all future updates free of charge. 2. Tell me more about your company. We're a small company of very agile software developers and security professionals. Being small allows us to develop software exactly as we see fit. It also allows us to listen to our users and implement features our users request. We are not a faceless corporation who's main goal is profit. We want You to fall in love with our application and we want it to make your life easier. 3. What do I pay for? Item you purchase is the highly polished piece of software which allows you to record everything what happens on any computer you own. Recording process is completely invisible to the user. We've put a lot of effort into making GigaWatch stand out and offer the most satisfying user experience. You pay for the product which will be constantly updated and you are eligible to download any updates we release completely for free. We may increase the price of the product in the future as we add more features to it. By securing your copy early, you save money and give us resources to work hard and make this application the best computer monitoring solution available. 4. Will GigaWatch work on my computer? GigaWatch is designed for Windows® 7, Windows Vista® (including 64-bit editions) and Windows® XP computers. We do NOT support Mac OS X. Sorry! 5. How much disk space will GigaWatch take? The answer depends on many factors, such as how frequently you set GigaWatch to record screen snapshots and how many days you allow GigaWatch to record before automatically deleting old snapshots. Also, the amount of disk space needed depends upon how much the computer is used, just a few hours after school or in the evening, or a full 8-hour day. We recommend 0.5 GB of available hard disk space, which would be enough for more than one week of recordings with the default settings. 6. Is GigaWatch like Internet filtering software? No. We do not believe that filters are very effective. They too often don't catch the web sites you want to stay away from, and they often prevent you from visiting completely legitimate sites. We believe that recording what people actually do is the best way to keep them from inappropriate sites. When people know they may be watched, they are much more careful about what they do. 7. Can I use GigaWatch and an Internet filtering program at the same time? Yes. GigaWatch works independently from Internet filtering programs. 8. Can I install GigaWatch on someone else's computer? You can only install GigaWatch on computers you own. Before installation, you must agree that you're installing it on the computer you own. 9. Can I monitor my spouse with this software? You should NOT attempt to monitor your spouse, significant other or adult children with GigaWatch without the consent and knowledge of such persons. Doing so may violate local, state or federal laws and you could be subject to civil or criminal penalties. 10. Should I inform my employees or others that they are being monitored? Yes. The GigaWatch software license agreement requires that you inform anyone you may monitor with GigaWatch products. 11. Can I use the information recorded with GigaWatch as evidence in a court of law? We can not guarantee that you will be able to use the recordings in a court of law. A judge determines the admissibility of evidence on a case by case basis. You should assume that the information recorded would not be permitted as evidence. 12. Can GigaWatch be circumvented? GigaWatch prevents unauthorized users from tampering with it's monitoring module by implementing Stealth Technology. When installed in Stealth Mode, GigaWatch does not show up as an icon, does not appear in the Windows system tray, does not appear in Windows Programs, does not show up in the Windows task list, cannot be uninstalled without the GigaWatch password which YOU specify, and GigaWatch does not slow down the operation of the computer it is recording. Remember to strip monitored users from administrator privileges. Skilled users with administrator rights can modify or uninstall practically anything in the system including GigaWatch. 13. How easy to install and use is GigaWatch? We have designed GigaWatch to be very easy to install and use. Installation should take less than two minutes, and GigaWatch automatically begins recording. If you want to customize what GigaWatch records, then you can easily change the default settings. 14. Does GigaWatch come with money-back guarantee? If GigaWatch does not perform as advertised, please notify us within 14 days of purchase. Our customer support staff is available 7 days a week, and we will do our very best to make sure the product performs properly. Assuming you have notified us within 14 days of purchase, if we are unable to resolve the issue within 3 days of your notifying us, we will refund your purchase price in FULL. Please note that we do not provide refunds for simply changing your mind. 15. How soon can I get GigaWatch? GigaWatch is available now for immediate digital download. From our site, you can purchase, download, install and begin using GigaWatch in less than 5 minutes, even if you download using a dial-up connection! Click here to purchase and download GigaWatch now. Remotely monitor any computer on your network from one PC. 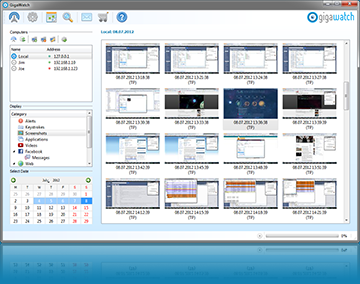 Securely synchronize gathered data by downloading only the latest entries in encrypted form. All gathered data is heavily encrypted with strong AES-256 algorithm. You can set up GigaWatch to generate alerts when a specific action is generated by the monitored user. You can set up keywords to be detected when user is typing on the keyboard. When it detects a sequence of keystrokes that form the keyword you added into the configuration, it will grab a screenshot of what the user was currently doing with some additional information for you to review later. You can also do the same for detecting keywords in website addresses the user visits. Set up keywords that consist of swear words and you'll be able to know how often your children use foul language in their conversations. Add keywords that include your home address and you'll know when and with whom your child shares personal information. Additionaly you can add website keywords related to pornographic material and you'll be notified whenever your kids view content not appropriate for them. By adding keywords related to work in your company, you will find out if anyone is sharing company secrets with third parties. GigaWatch will monitor all keys the user types on the keyboard in any application they use. The biggest advantage of this feature is that it will translate all special keys into readable form like ä, ö, ü, ß. .
Find out what your children are talking about their peers and see exactly what information they share with the outside world. Monitor if your employees spend time chatting or leaking information to your competitors. Capture full resolution screenshots of what the user sees on the screen. You can set your own time interval and thus decide how often the screenshots should be saved for your later review. You can also set your own size limit of how much disk space can the screenshots consume on monitored computer. If the limit is reached, old screenshots will be automatically deleted to free up space for new ones. Seeing exactly what your children are seeing on the screen is crucial to find out how they use the computer. If you spot anything suspicious, you can approach them and talk about it, in order to explain to them what could be wrong in what they're doing. This feature will let you know visually how the people working for you spend their time at work. You'll be able to see if they play games or browse Facebook instead of doing the tasks you ordered them to do. This feature lets you see what applications has the user been using and for how long each application was active. It will calculate total time each application was used and also display the list of time periods when the application was active. For your convenience it will also show small icons next to each application for easy review. If you need to know how long your children play games, you'll love this feature. It can show you exactly when your child was surfing the internet or playing games instead of doing homework. Do you employees have to use an application which is specifically related to the work they're doing? See how many hours a day they actively use this application and how much time they spend using Firefox, Internet Explorer or playing games. Pinpoint employees who do the actual work and those who do everything apart from it. Find out what internet videos users watch on video streaming sites like YouTube. You'll be able to see the video image thumbnail, title and time when the video was viewed. When you double-click the displayed video entry, it will directly open the video link, so that you can investigate what the video was about. Internet is filled with videos inappropriate for children. This feature will let you know what content your kids watch and it's for you to decide if it's fine for them to see or if they shouldn't be interested in those particular subjects. Want to see how many and what videos your employees watch at work? This feature can let you measure their effectiveness at work more efficiently. Facebook is currently the most popular social communication platform and millions of people use it every day. This feature captures all sent and received chat and normal messages on Facebook social network. It supports logging messages from threads that consist of up to 64 conversation participants, displaying them in easy to read and clean form. Get to know what your children chat about with their friends or complete strangers. Before you can prevent any disasters, you have to see them coming first. See if your employees talk about your company on Facebook and see what kind of information they share with the outside world. Knowing what they talk about can prevent them from leaking sensitive information. We are happy to say that we are first to support logging chat messages in Skype application. Skype is very popular instant messenger these days and it is very important for compter monitoring software to support it. With this feature you'll be able to see all conversations between two or more users in easy to read form. With Skype being one of the most popular instant messengers, it is very likely your children use it to communicate with people on the internet. Find out what your kids talk about with their peers or complete strangers. Find out if your employees don't share company secrets through the instant messenger or if they spend too much time talking to their friends, at work. This category will show you which websites computer users visited while they were using the computer. You can double-click any address in the tree list and it will take you directly to the website of interest. Are you concerned about your children safely browsing the internet? Knowing which websites your child views, you can be constantly in control of what content they are interested in. It's then for you to decide whether this content is appropriate for them or not. Find out if your employees are looking for another job on work portals or if they browse websites that can put your company in trouble. You can see everything that may possibly damage the status of your business. It may be unethical to look at or use someone's logins and passwords, but sometimes you are in the situation that you just must know. This feature will log any logins and passwords entered in websites' authentication forms. We are aware that most websites these days use secure (HTTPS) connection during the login process and we've made sure we are able to bypass this protection. In case of emergency, you'll have logins and passwords to your child's Facebook and e-mail account giving you ability to act. You'll never be left without options when the situation demands that you learn as much of your child's latest activities. Competition never sleeps and it's more and more common that competitors send their spies to companies they compete with. This feature will save you a lot of time and money if you ever need to track down a mole among your employees. These days everyone knows how to use popular search engines and most people use them even several times a day. The search queries they enter can provide you with most valuable information like problems they look up solution for. GigaWatch will track search queries on the most popular search engines like Google, Bing, Yahoo and YouTube. Can you see that your child has a problem, but won't tell you what it is? They'll definitely look for the solution on the internet and you can know exactly what is that they look for before it's too late. Find out if your employees are looking for another job on work portals or if they look for content that can put your company in trouble. You can see everything that may possibly damage the status of your business.